We’ve always had a thing for hearts and cats. As children, we loved Lisa Frank and Garfield. As teenagers, we idolized Catwoman and rarely left the Salvation Army without something with a heart on it. 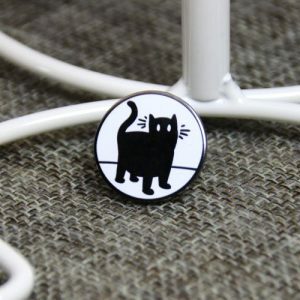 And as adults, we love to use cat pins to decorate our clothes, pillows, key chains and refrigerator doors. 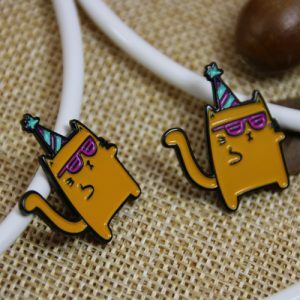 Here’s a cat party at GS-JJ, hope you’ll enjoy it( just click on any item you’re interested in). 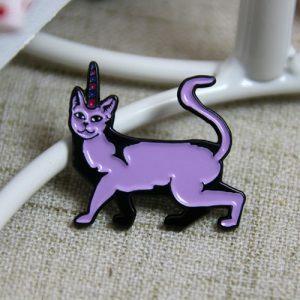 Say Hello to our new GS-JJ member Purple Cat Pins. We will hopefully be seeing a lot of this cute cat as time goes on. 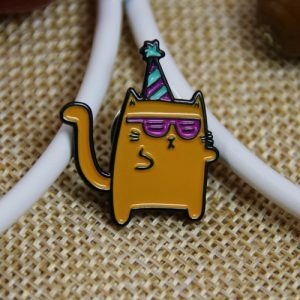 This purple cat pin can be used for recognition and reward or great to add to your collection wall! 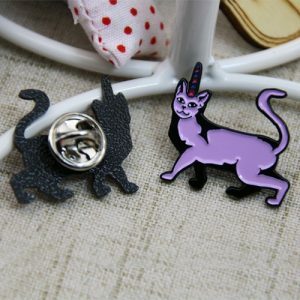 This lapel pin is made of fine jeweler’s metal, soft enamel filled with purple cat colors, and black dye plated. 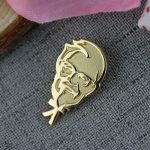 It comes with a butterfly clutch back making a secure appearance on your lanyard, I.D. 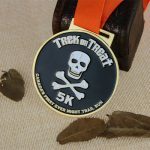 badge, lapel and hat. Each comes to you individually poly. And there is an orange cat, which is good at dancing. It close its eyes and wear a pair of glassed and triangle cap on its head. Is so lovely? Dig up cat art for your walls or to decorate your backpack.Also you can bedeck your neck with your favorite breed using a tie or a necklace.